TOCCATA returns this week with its annual performances of Handel'ss "Messiah." 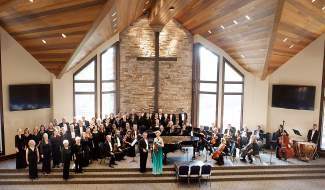 INCLINE VILLAGE, Nev. — The Toccata-Tahoe Symphony Orchestra and Chorus will perform its final series of the 2015 Tahoe Summer MusicFest beginning Wednesday, Sept. 16, at 7 p.m. in the Corpus Christi Catholic Church in Carson City. The concert series commemorates the 14th anniversary of the 9/11 tragedy and features international violin soloist, Elizabeth Pitcairn. The program opens with Verdi’s solemn symphonic-choral masterpiece, Requiem, with soloists Joy Strotz, Anna Helwing and Irina Kasimova, sopranos; Liudmila Mullin, mezzo soprano; Michael DeWayne and Chris Nelson, tenors; Stuart Duke and Chris Langton, baritones; and the 70-voice Tahoe Symphony Orchestra Chorus. The Requiem is composed in seven sections, but only five will be performed. The concert concludes with Elizabeth Pitcairn performing Mendelssohn’s Concerto for Violin in E minor, Op. 64 on the legendary Red Stradivarius Violin. Maestro James Rawie, Toccata’s founder and artistic director, will conduct all performances. The concert will be repeated on Friday, Sept. 18, at 7 p.m. at St. Theresa Catholic Church in South Lake Tahoe, and Sunday, Sept. 20, at 3 p.m. at Cornerstone Church in Incline Village (300 Country Club Drive). The final performance of the 9/11 Memorial Concert series will be Tuesday, Sept. 22, at 7 p.m. at Our Lady of the Snows Catholic Church in Reno. There will be two Soiree Musicale Fundraisers for this concert series — one on Saturday, Sept. 12, at 4 p.m. at a private home in Incline Village, and the other on Saturday, Sept. 19, at 4 p.m. at a private home in Zephyr Cove. Tickets are $125 and may be purchased at toccatatahoe.com/tickets.html. For more information, call 775-313-9697 or email ToccataTahoe@gmail.com.